In terms of enhancement of the immediate setting the DRP also referenced the landscape and ecological responses. 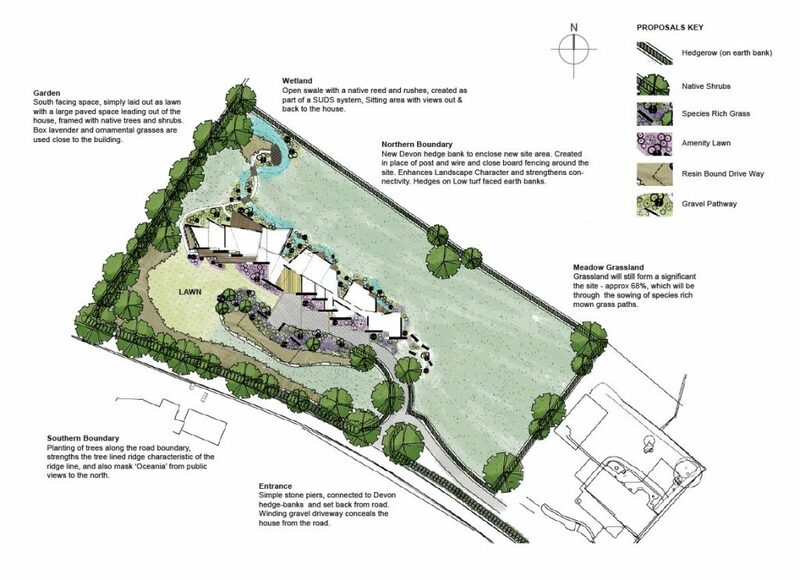 Here we were able to illustrate how the holistic approach to the design of the building, landscape and ecological response manifested within the proposal. 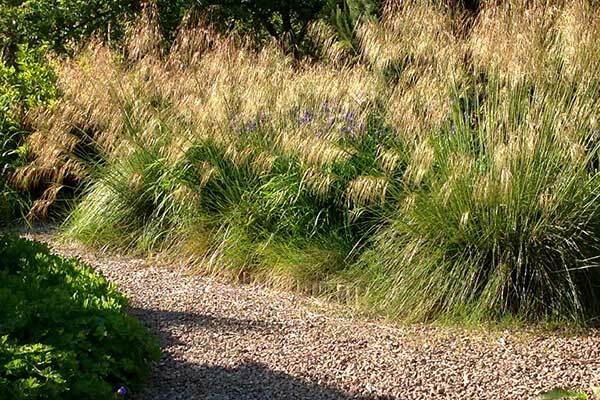 The landscape design is considered by the Panel to be extremely competent. 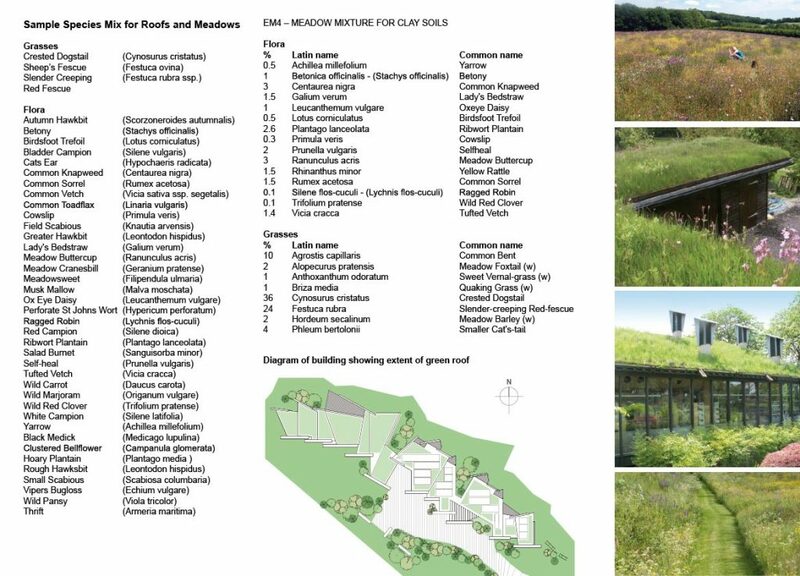 Furthermore, the Panel considers that the specific plant choices proposed within the landscape design are appropriate for both the reasons that they may be ecologically appropriate, and also that the plant choices indicated reflect the architectural design of the building. Key public views exist to the north east of the site at approximately 1km distance. Views are gained from the public highway to the north and north west; public footpath north east around Higher Lathy Farm and also on Dandy Lane. These views tend to be vista views from lower elevations directly onto the site. Views are framed by vegetation within the landscape. Views from Poltimore House and listed grounds are obscured by vegetation. 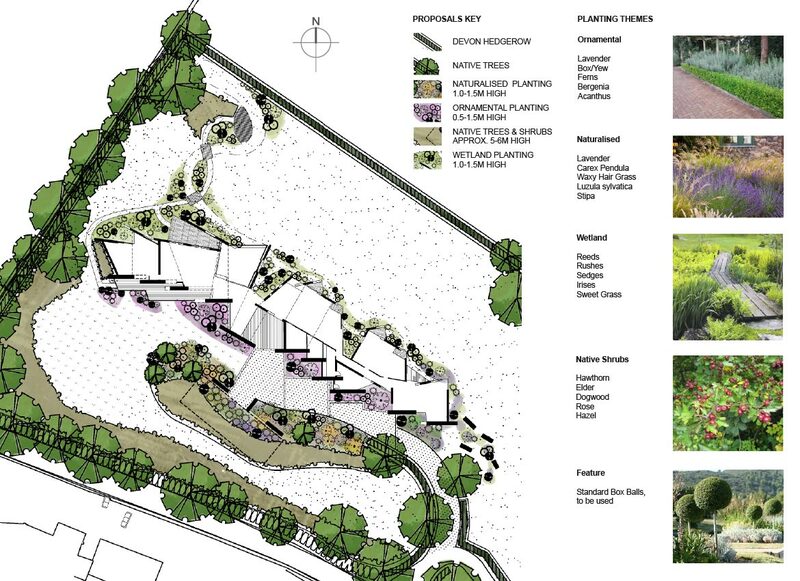 An illustrated study design was created to indicate landscaping, boundary shielding and overall flora planting. 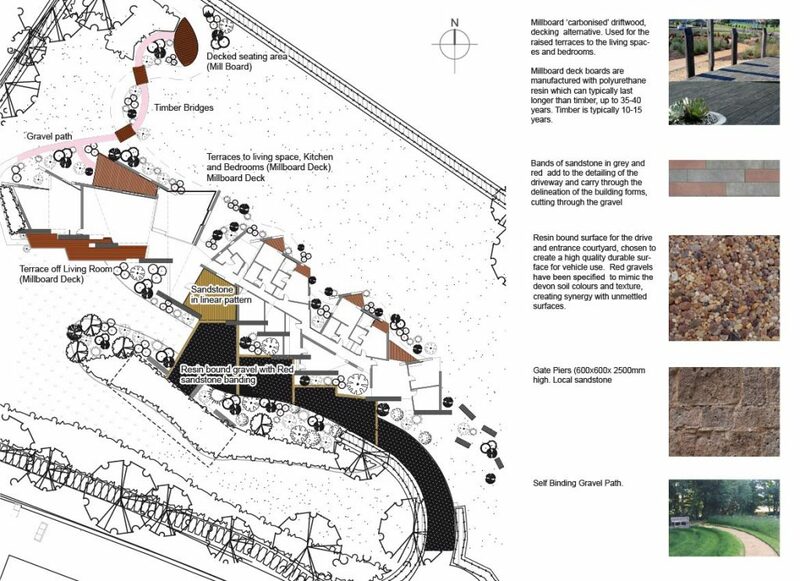 A critical design factor was how to use water on site, how to drain it and how this integrated with the landscape topography. Water recycling was studied with surface water, greywater and blackwater all being carefully considered. Surface water from roofs and hard surfaces which is not used for flushing toilets and garden use will be conveyed to a wetland through an open swale. This will form a significant landscape feature on the site where water is retained at a close level to the surface. 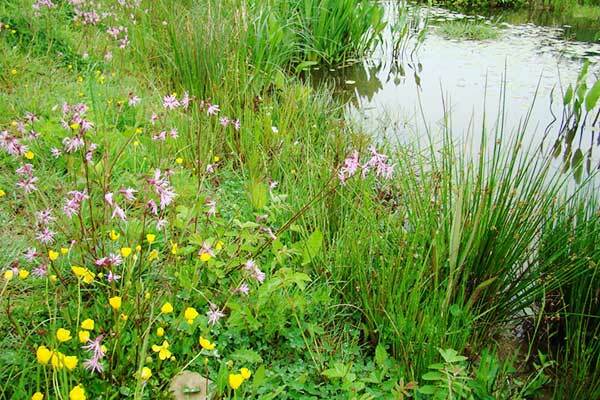 it allows a range of marginal aquatic and bog plants to thrive. Water used in homes has long been thought of in terms of clean drinking water (know as potable water) coming into the house from the mains and exiting sewage. However, the wastewater from baths, showers, washing machines, dishwashers and sinks fits somewhere in between and this is referred to greywater, which typically makes up between 50-80% of a household’s waste water. Roughly a third of the water used in households is used in toilets which comes into contact with human waste and is know as blackwater. Greywater is much easier to treat and recycle when compared with blackwater; there is no faecal matter that is a haven for harmful bacteria and disease causing pathogens. Recycling greywater can save approximately 70 litres of potable water per person per day in domestic households (with appropriate treatment where applicable). 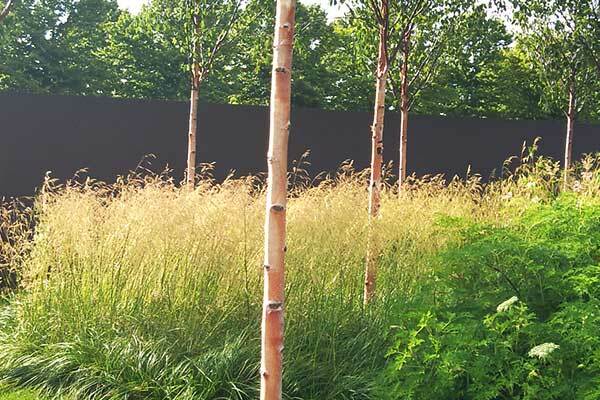 The landscape design extends to “hard” and “soft” details including decking, paving, gravel, trees, ornamental planting, wetland planting and hedgerows. Species of hedgerows and the planting plan are considered to be of great importance. 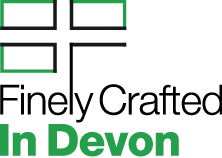 The Devon White Beam is subject to Biodiversity Action Plan (BAP). Considering the fact that the entire population of some of the species consist of just a handful of known trees in a few localised areas, they are highly vulnerable, both to habitat loss or degradation and to more individual hazards, such as specimen collection. The Devon Whitebeam is largely a hedgerow species, but also occurs in a few sites on rocky oak wood and even moorland edges. 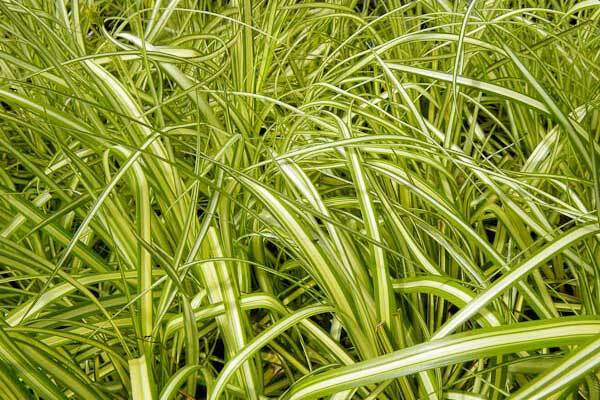 It is essentially a species of acid soils. The application site would be ideal to include the Devon Whitebeam into the hedgerow mix. 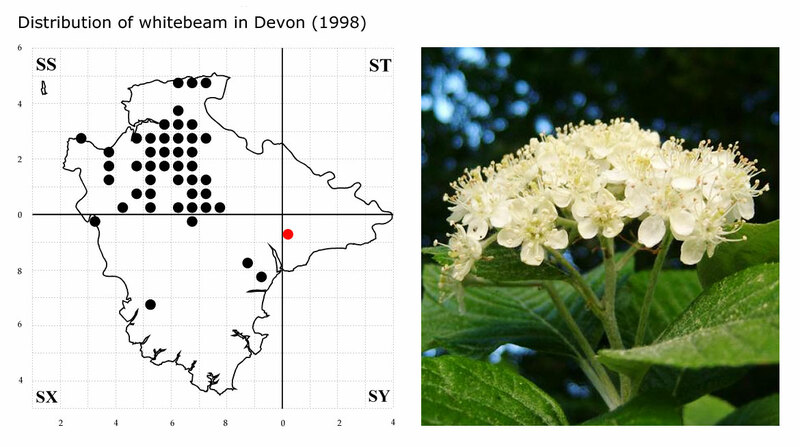 Item 6 of the Action Plan: Encourage the propagation and planting of Devon Whitebeam in public places to raise public awareness and increase the population of the species (ensuring that records of all plantings are sent to BSBI/DBRC). The site will be shielded by trees from many viewpoints. Planting proposals are featured here. A diverse variety of grassland is proposed for planting. The grass will cover outlying areas of the site and more immediate sections around the building. A diverse variety of grassland. 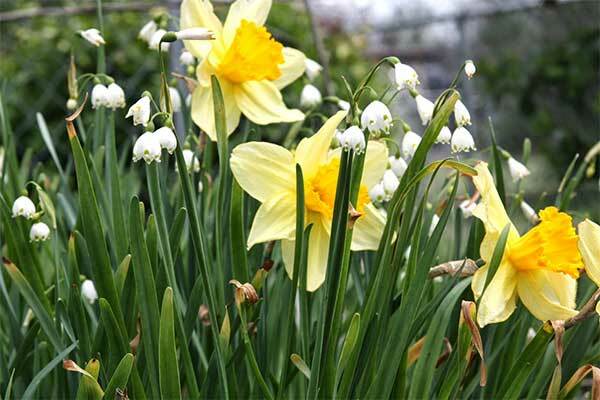 The site will feature planting schemes designed to become established within a very short period of time.